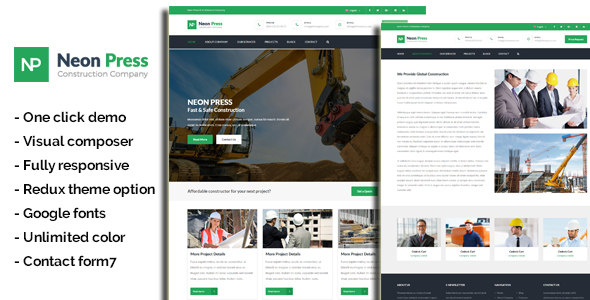 Neon Press is a WordPress Theme for any kind of construction businesses .We have put a lot of effort into making every piece of this template right in place NeonPress was made with a clean and modern responsive design and a focus on good visitor experience. We built this theme on Visual Composer, a very convenient drag-n-drop PageBuilder for WordPress. It should provide you with the smoothest experience while creating your website with our theme. The WordPress theme is responsive, you can view it also in the mobile/tablets devices and it looks very in more devices. Neon has been tested with browsers IE10, IE11, Firefox, Safari, Opera, Chrome.